Best grown indoors in a container. 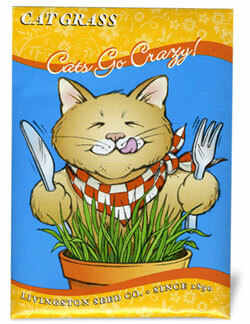 Cat grass is good for cat's digestion and may save your other house plants. Rich in vitamins, minerals and enzymes that are beneficial for your cat's fut. Garden Tip: Water, cover with plastic wrap and place in a warm spot until seeds sprout; then remove plastic. Water only when dry. Allow your cat to enjoy when plants are 3" high. When grass starts turning yellow, the chlorophyll is gone, and it's time to replant.